The life-cycle cost (LCC) of a structure in seismic regions, which includes the initial and the post-earthquake repair cost, is a critical parameter for structural engineers and other stakeholders. The LCC analysis has been gaining prominence in recent years since civil infrastructure sustainability has been identified as one of the grand challenges for engineering in the 21st century. The objective of this chapter is to first identify the components in LCC evaluation that directly affect the outcomes, and propose strategies to improve the reliability of the analysis. The shortcomings of existing studies on LCC optimization of structures are identified. These shortcomings include simplified analysis techniques to determine the structural capacity and earthquake demand, use of generalized definitions for structural limit states, and inadequacies in treating uncertainty. In the following, the problem formulation and a brief review of existing literature on LCC optimization of structures are provided. A LCC model is presented, and techniques are proposed to improve the above mentioned shortcomings. Finally, LCC analysis of an example reinforced concrete (RC) structure is employed to illustrate the methodology. Structural optimization problems may be divided into three classes: sizing, shape and topology optimization. In sizing optimization, the locations and number of the structural elements are fixed and known. Usually, the problem is reduced to optimization of the properties of individual elements to find the optimal solution. In shape optimization, the contour of the boundary of a structural domain is optimized while keeping the connectivity of the structure the same, in other words, no new boundaries are formed. Topology optimization is the most general in the sense that both the size and location of structural members are determined and formation of new boundaries are allowed. The number of joints in the structure, the joint support locations, and number of members connected to each joint are unknown. In other words, topology and shape of the structure are optimized in addition to the shape of individual elements. Figure 1 illustrates the sizing and topology optimization problems for a structural frame. The structure being optimized may vary significantly from a component of a mechanical device to a member of a full-scale structure depending on the problem. Most problems in structural earthquake engineering fall into the category of sizing optimization and deal with full-scale structures. The problems in structural optimization may also be classified based on the number of objectives, i.e. single- and multi-objective. 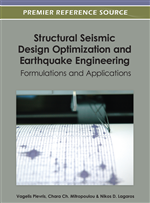 For single-objective seismic design optimization problems, the objective is usually selected as the initial cost for reinforced concrete (RC) and total weight for steel structures; and the performance is determined based on the conformance to the requirements of a seismic design code. The code provisions are usually introduced to the problem as constraints. Some example studies include Moharrami and Grierson (1993), Adamu et al. (1994), Memari and Madhkhan (1999), Zou and Chan (2005) and Sahab et al. (2005). As a consequence of the formulation of the problem, the majority of the single-objective optimization methods provide a single optimal solution (which minimizes the objective and satisfies the constraints). However, the decision maker does not have a broad view of to what extend the constraints are satisfied. Thus, she has to either accept or reject the optimal solution. On the other hand, since more than one objective is considered in multi-objective optimization problems, commonly a set of equivalently optimal solutions are obtained which provides the decision maker the flexibility to tradeoff between the solutions and she may base her selection on rather transparent results. Some example multi-objective studies include Li et al. (1999) and Liu et al. (2006). Consideration of all major sources of uncertainty, from seismogenic source characteristics to material properties and structural modeling in calculating the limit state exceedance probabilities.